Jim Quilleran, who lives in Pickax "four hundred miles north of everywhere" is influencing the town in small but subtle ways. When the only bookstore burned down, he wrote a column for the Moose County Something declaring that every town needed at least one bookstore. After pulling some strings with the K Foundation, they agreed to sponsor a bookstore and Quill's girlfriend Polly is going to run it. On the day of the ground breaking ceremony, the famous Siamese feline Koko gives out his death cry and shortly after a man's body is found on some property that Quill owns. Since there is no way Quill can do anything to help the police solve the murder, he immerses himself in events that will keep his mind off the subject, but if he listened to Koko he would know who the killer is before he struck again. 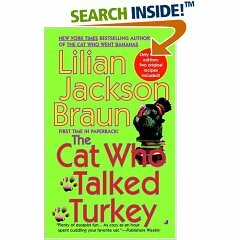 Long time fans of this series will absolutely love THE CAT WHO TALKED TURKEY. The narrator refers to Koko talking turkey to some wild turkeys and their children who have moved into the neighborhood. Koko's psychic abilities are the key to solving the who-done-it. The darling feline is really the star of THE CAT WHO TALKED TURKEY. It would not surprise this reviewer at all to one day see Koko openly rule Pickax and everything within a radius of four hundred miles. James Qwilleran and his famous felines, Koko and Yum Yum, are back for another mystery-solving stint in the beloved bestselling Cat Who . . . series. In Qwill's opinion, "A town without a bookstore is like a chicken with one leg," and since the late Eddington Smith's bookstore burned down, the town of Pickax has been somewhat off balance. To the rescue comes the Klingenschoen Foundation, manager of Qwill's estate, which considers a new bookstore a worthy investment. Delighted by their good fortune, the people of Moose County prepare to celebrate the gala groundbreaking of the store on the site of the old. But no one is prepared for the discovery of the body of a man shot execution style in a wooded area on the very same day. Now Qwill and his clever cats have their work cut out for them.